Welcome to SpeakBeat Metronome! "The app that counts out loud so you don't have to!" Metronomes, professional tools to mark time at a selected rate, are widely used by musicians, both music teachers and music students alike. SpeakBeat Metronome brings a realistic simulation of a metronome to your iPhone device, and it is accurate, precise, and totally reliable. To set up this musical tool, you just need to specify the tempo, set the time signature, pick which subdivisions to speak and leave the rest to SpeakBeat Metronome. There are many other customizations available for users of all types. SpeakBeat Metronome is a convenient and reliable application for your iOS device, a perfect alternative to a traditional metronome. It's a great companion for playing piano or guitar. The clean and modern interface of SpeakBeat Metronome is so user-friendly, you don't need to be a genius to figure it out. This powerful tool for musicians has a unique talking feature. Choose from a selection of voices and this spoken metronome will count the numbers out loud for you, letting you focus on your musical instrument. How does this metronome app stand out from the competition? One. SpeakBeat Metronome and its many customizable options can count out complex meters and precise rhythms at any BPM. Two. Choose from a wide range of time signatures, subdivisions, and even multiple bars. Three. A super easy configuration panel makes all this simple both for amateurs and professionals. No matter whether you're a music teacher, a music student, an instrument player (piano, guitar, drums, brass, woodwind, and more), a dancer, a choreographer, a fitness instructor, or a cheerleader, SpeakBeat Metronome has you covered. Thanks to SpeakBeat Metronome's count out loud feature, the app does the "one two three four" for you and you do the concentrating on the notes or steps while the BeatSpeak. 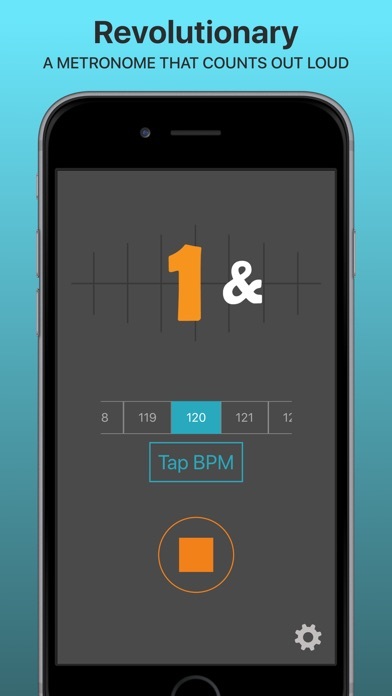 Download SpeakBeat Metronome on your iOS device and never miss a beat again. Let us know of any questions, feature requests, bugs, or other suggestions.